Thrilled to be joining the Cybils graphic novels panel for a second year, it's time for me to step up my game when it comes to this genre. 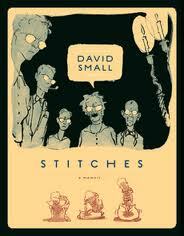 My school librarian recommended Stitches, a 2009 National Book Award finalist from illustrator David Small. This bleak memoir is a testament to survival despite a truly awful childhood. 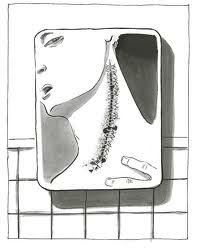 After a cancerous growth on his neck leaves him voiceless, young David realizes that silence is what is most appreciated from his deeply unhappy parents, who may have given him the cancer and then tried to hide it from them. As befitting the subject, many of the illustrations have no words, just images of David's agony. Small is a brilliant artist, lending ugliness to all of his memories and only allowing his kind therapist a touch of happiness (in the guise of the white rabbit from Alice's Adventures in Wonderland). Readers who enjoyed Maus and have an appreciation for dark personal histories will want to read Stitches. While it's not appropriate for my middle school students, there are many older readers who will devour Small's story.